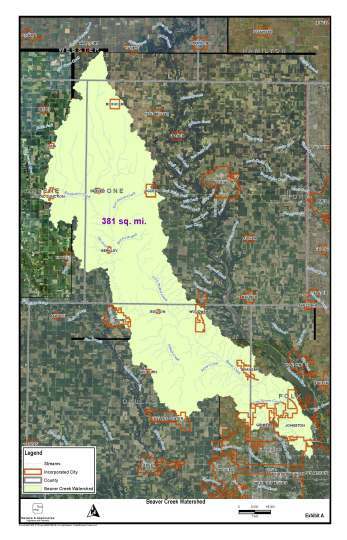 The Beaver Creek watershed covers 244,347 acres in Polk, Dallas, Boone, Green, and Webster counties. The creek and its tributaries run for over 100 miles before joining with the Des Moines River. Many jurisdictions are located within the watershed boundaries including: Boxholm, Dana, Ogden, Beaver, Grand Junction, Berkley, Woodward, Bouton, Perry, Granger, Minburn, Dallas Center, Grimes, Johnston, Urbandale, and Des Moines. The landuse within the watershed is dominated by agriculture with only a small urban area located in the southern reaches. Flooding, high nutrients, and high levels of sediment are the main issues seen throughout the watershed. A Watershed Management Authority is being created to address these concerns and determine methods of action to overcome them.